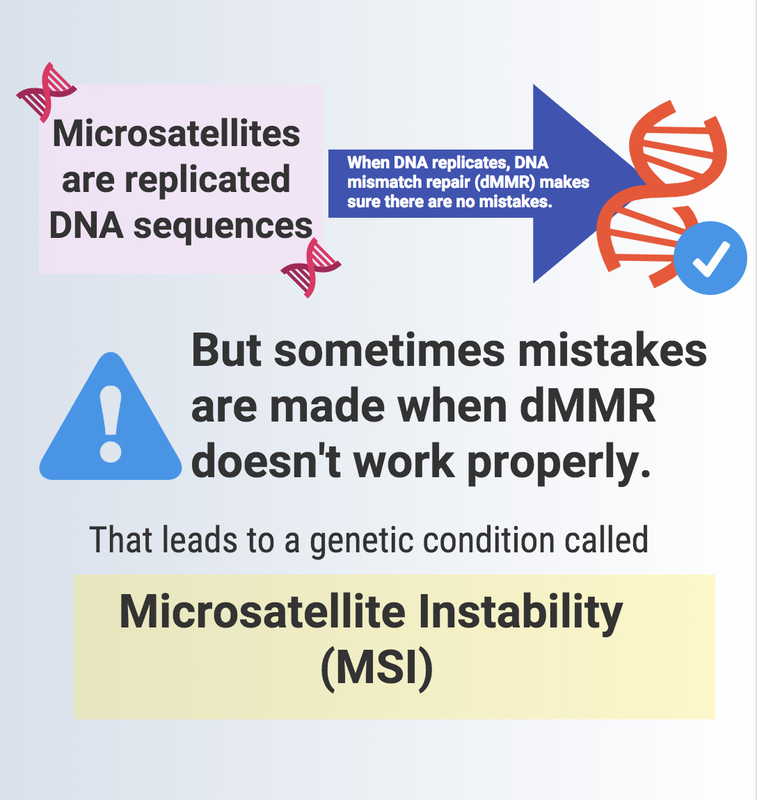 Microsatellite instability (MSI) is a signature associated with the process of when the proteins that are responsible for repairing errors in genes do not fix errors made while DNA is replicating, also known as DNA mismatch repair (dMMR). MSI is typically found in patients with colorectal and endometrial cancer. There is an immunotherapy regimen that is specifically approved for patients whose tumors test for MSI. Keytruda (pembrolizumab) is FDAapproved for previously-treated patients with microsatellite instability-high (MSI-H) or mismatch repair deficient (dMMR) cancer. The drug duo Opdivo (nivolumab) plus Yervoy (ipilimumab) is also approved for metastatic colorectal cancer that is found to be MSIH. If a person’s cancer is MSIpositive, that could be an indicator for Lynch syndrome, which is an inherited syndrome that puts people at a higher risk for developing colorectal and gynecologic cancers. After testing positive for MSI, individuals might want to also ask their providers about Lynch syndrome, and have their family members tested, too. MSI status may be more common in patients who are over the age of 50, according to recent research. However, despite these findings, only about onethird of patients older than 50 undergo genetic testing.